Over the past two decades, Keb' Mo' has proven that he is a musical force that defies typical genre labels. Album after album, 14 in total, garnered him 4 GRAMMY awards and a producer/engineer/artist GRAMMY Certificate for his track on the 2001 Country Album of the Year, Hank Williams Tribute – Timeless. He has received 11 GRAMMY nominations, in total, including Country Song of the Year for “I Hope,” co-written with The Dixie Chicks, and 3 alone for his 2014 self-produced release, BLUESAmericana including Americana Album of the Year. Keb’ has also been awarded 11 Blues Foundation Awards and 6 BMI Awards for his work in TV & Film. Keb’ has cultivated a reputation as a modern master of American roots music through the understated excellence of his live and studio performances. Artists who have recorded his songs include B.B. King, Buddy Guy, the Dixie Chicks, Joe Cocker, Robert Palmer, Tom Jones, Melissa Manchester, Solomon Burke and the Zac Brown Band to name a few. His guitar playing has garnered him 2 invites to Eric Clapton’s acclaimed Crossroads Festival and has inspired leading instrument makers, Gibson Brands, to issue the Keb’ Mo’ Signature Bluesmaster and Bluesmaster Royale acoustic guitars and Martin Guitars to issue the HD-28KM Keb’ Mo’ Limited Edition Signature model. He has been featured in TV and film, playing Robert Johnson in the 1998 documentary “Can’t You Hear The Wind Howl”, appeared three times on the television series, “Touched By An Angel”, and was the ghostly bluesman Possum in John Sayles’ 2007 movie, “Honeydripper”. Keb’ created “Martha’s Theme” for the TV show Martha Stewart Living. 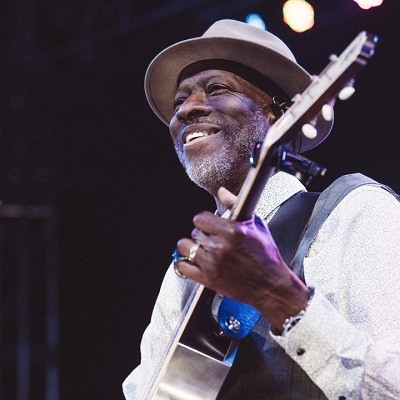 In 2017, Keb’ Mo’ released TajMo, a collaborative album with the legendary Taj Mahal, which has since earned a GRAMMY Award for Best Contemporary Blues Album.